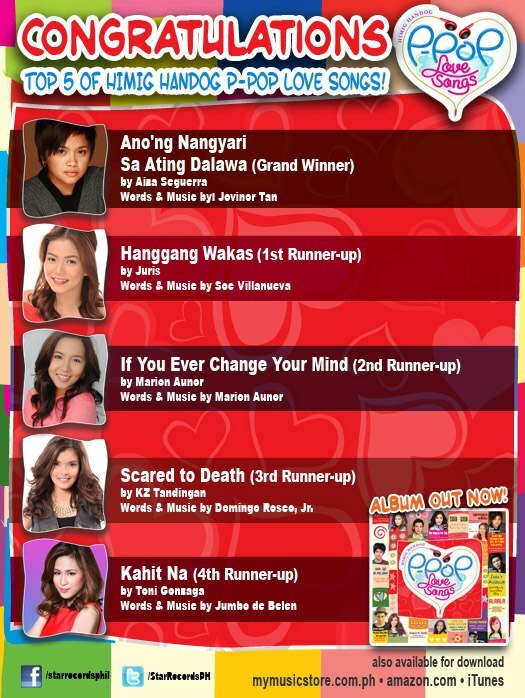 Last Sunday the winner of the Himig Handog P-pop love song emerge as it was interpreted by no less than Aiza Seguerra. The song Anong Nangyari which is a song that talks about someone reminiscing and trying to figure out what went wrong in their relationship. Though I do have a favorite song among the 12 finalists I couldn't argue that this song deserves to win. Here's Aiza's finale performance that night. Meanwhile here are the other winners of the song fest. I am happy about the result of the contest though I would hope that in the future veterans should be excluded from the competition and give way to newer and fresher talents and ideas. I mean some of them already know how to win. I leave my statement to that and would no longer expound. Lastly even if Scared to Death didn't win it still is my favorite because it has one of the most refreshing song in the contest when it comes to the lyrics.